Mort Kunstler Handsigned & Numbered Limited Edition Masterpiece Collection Giclee on Canvas: "Gen. Thomas J. Stonewall Jackson"
Overall Size: Image size: 26" x 40"
He's the premier historical artist in America - and now he focuses mainly on the American Civil War. 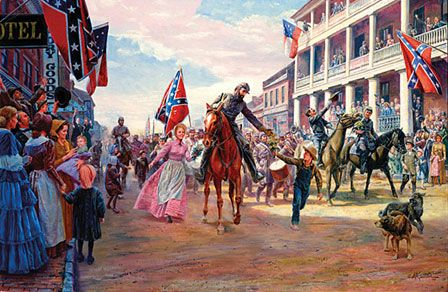 When Mort K�nstler began his current emphasis on Civil War art in the early 1980s, he had already accomplished more than a half-dozen artists could hope to accomplish in a collective lifetime. From portraits of prehistoric American life to the odyssey of the space shuttle, Mort K�nstler had painted America's story - and was already renowned as "the premier historical artist in America." When he placed his focus on Civil War art, Mr. K�nstler quickly established himself as the country's most-collected Civil War artist, and earned unprecedented acclaim within the genre of Civil War art.